Formed as a garage band in Ballyfermot in 1978 and actively gigging by 1980, Average Contents derived their name from the "average contents" text printed on the side of a box of matches. There was a poster based around this designed by Jack Dolan, who worked as a graphic designer. Average Contents began playing covers of Thin Lizzy and the Rolling Stones but also some Jethro Tull ("Aqualung") and The Eagles, before beginning to play more of their own material. Jack Dolan lists the bands main influences as Thin Lizzy, The Eagles, Jethro Tull, Pink Floyd, the Stones, ELO,.. Ferdia Mac Anna described them as heavy metal in In Dublin magazine in May 1979. The band's main songwriter was Stephen Smallhorn who studied formal orchestral composition and was a prolific writer. Much of the bands original material was classical rock in approach, with 'concept' storyline lyrics and long (10+ minute), thematically linked musical pieces. 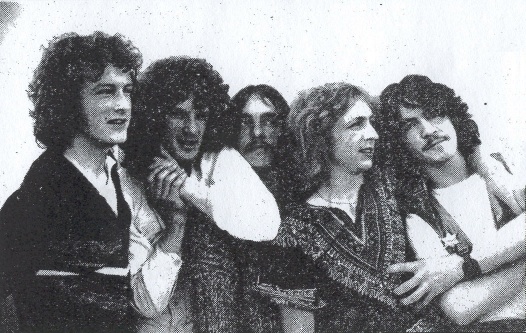 They rehearsed at Dorset Street studios run by Vince Bowe (of AWOL) and recorded a demo in Harcourt Street studios which led to an interview with Dave Fanning (aired on Radio Dublin?). They played the usual haunts around Dublin including Toners (Sunday afternoon gigs in 1979), McGonagles, The Steering Wheel on Mary Street (including a Friday night residency in June 1979) and others. Average Contents supported Stepaside on a number of occasions, who were a big local band at this time. This led to the support slot on an Irish tour which imploded when manager Frank Ryan disappeared with the tour funds [allegedly], leaving the band in the lurch. This story made the press at the time, including the NME--anyone remember this? The band recorded a demo in preparation for this tour which got a lot of airplay. It contained two tracks inspired by Shakespeare's Macbeth: "White Knight" and "The Raven". A single was also considered, as Jack Dolan remembers producing artwork for it. Alas it was never released and the artwork is lost. A photo shoot was also done in preparation for this aborted tour. If anyone has any of this material, please get in touch! There were a number of lineup changes along the way. Drummer Kenneth Crosbie was replaced by Pat (Fats) Rooney (ex Rocky DeValera & the Gravediggers; the band also inherited the Gravediggers manager known as The Daawg). Rooney subsequently made way for Brian Whitehead (?) (from Le Fanu Road, Ballyfermot). There were also a few other guitarists in the band over the years, including John Dillon of Assassin, who played second guitar in a five man lineup on 1979. They split for the usual kinds of reasons, though mainly because some of the band wanted to relocate to the USA. Stephen Smallhorn, Paul Norgrove and Pat Rooney all did emigrate to the USA where they started a new band. Jack Dolan is now a woodturner.